Following residents of Gaylee and other areas aggressively resisting over 400 families evicted from land in Lwandle, Strand, being relocated to their area, members of the Ses’khona People’s Rights Movement have threatened to dump excrement from ‘porta-potties’ on Blackheath residents’ homes. On Wednesday a group of about 10 volunteers from Ses’khona Peoples Right Movement took porta-potti buckets – used so effectively during the poo protests where faeces was dumped on local and provincial government buildings – to the proposed relocation area in Blackheath, threatening to attack Blackheath resident’s with faeces if they did not allow the Lwandle evictees being moved to the area. The Lwandle residents, who number over 800, were evicted on Monday and Tuesday last week amidst freezing wet Cape weather when land owner the South African National Roads Agency Limited (Sanral), armed with a court order, moved them off their land. 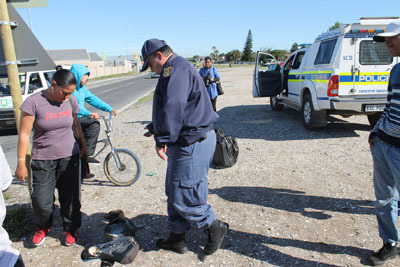 The eviction, in which rubber bullets and teargas were used to prevent residents recovering their belongings, sparked an outcry, with Human Settlements Minister Lindiwe Sisulu getting directly involved and the City of Cape Town offering a community hall as temporary accommodation. The intervention has led Sanral to since identify alternative land in Blackheath where the Lwandle families can erect emergency structures provided by City of Cape Town Disaster Mangement. But when the Lwandle evictees arrived at the Blackheath site on Monday this week they were met by a large group of residents from Blackheath housing settlements protesting against the establishment of an informal settlement in their area. Racist comments were hurled between the largely coloured Blackheath residents and predominantly black Lwandle evictees. Blackheath residents have since been guarding the relocation site. Yesterday about 10 members of Ses’khona, who have been fighting the Lwandle evictees cause, arrived in Blackheath armed with full porta potties. Ses’khona volunteer Thuliswa Biliza, (25) said the land identified in Blackheath belong to Ses’khona and if Blackheath residents did not allow Lwandle evictees to move onto it they would attack them with the buckets of faeces. Biliza said the plan was that each Lwandle family would get a site to build their shack and if Blackheath residents blocked them they would have the contents of a porta-pottie thrown at them. But faced with a group of about 30 Blackheath residents, the Ses’khona volunteers simply left the porta-potties next to the road. Ses’khona Secretary Loyiso Nkohla said he was not part of the group who went to Blackheath yesterday. Blackheath community leader Frederick Nefdt said they can’t allow shacks to be built next to their houses as it would negatively affect property values. “We’re paying bonds here, R5 000 each month,” said Nefdt. The City of Cape Town today announced that due to the situation which has developed in Blackheath, the Lwandle families would be moved to Macassar, where they will benefit from a major new housing project there. In a deal struck with Human Settlements Minister Lindiwe Sisulu, they will in the meantime be allowed to return to the land from which they were evicted last week, with the city providing building kits for them.